So, two birds had died, a cockateel and a parrot, and sad as it was it gave me the chance to practice a few things which will actually be helpful in maintaining other birds alive: catheters and external and internal fixation - this last one make me laugh, btw, bcs you all remember how much I enjoy orthopoedics, right? But this was different and cool. With birds you place the catheters inside the bone, and it was brilliant to actually feel the landmarks since I don't do so well with drawings, and I did a good job! Look! It's inside the bone but not so far up that it hinders normal movement. 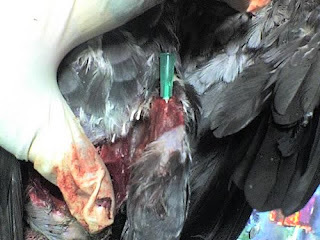 In a real surgery you'd clip both ends of the needle and secure them together with a roll of material that looks like playdough and is thermally activated when you roll it in your hand. That's how tiny these bone are, needles! And then on to repair a fracture in the parrot, both tibio-tarsal and femoral, I struggled a lot here too bcs I was working blind, feeling the bone pieces within the muscles, until he came in again and told me that super nerdvets may manage to but I needed to make an incision so I could actually see the bone piece and I did the femur after he'd shown me how to with the tibiotarsal and the good news is, I inserted the intramedullary pin and stabilised the leg but the bad news is, I used a medial approach instead of a lateral one, apparently the medial one is only used on the tibiotarsals, oops. Next time I'll know! There's more in my flickr page, poor mobile phone quality that they are, but know that I did my practising after the necropsy. I think the pictures are really not bad at all, gore-wise, but you lot are fragile as daffodils so I might as well nurture you. Lovingly. Now I have another budgie, raised on Harrison's and not very interesting and relegated basically to a footnote in our home since the arrival of the child. Perhaps the stuff doesn't taste very good. i'd feel a bit more nurtured if i were not eating dinner while scrolling down this post. otherwise, i want to know what kind of powers supervets have? On your way from Intern to SuperVet. Maybe we can get you a costume with big front logo and a cape. Anyway, beautifully done with all the needles and such. I have very little idea of what I'm looking at but I had a better idea of what was going on from your words. 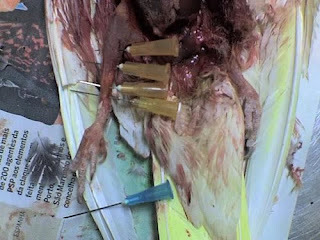 I had no idea that you could even PUT needles in bird bones. How interesting. Keep on rocking the vet world! PS~ Word verification is "cramrum". What one does on spring break, perhaps? I have nothing much to say about this post - just here to apologize for never being around when you call, to tell you that I am indeed one of the fragile ones (not because of the gore, per se, but because the poor bird is dead), and to note that the word verification today is hebusnu -- which can of course only be parsed as "He[e]b us, nu?" Which seems appropriate, all things considered, especially the Important Jewish Stuff you are setting off to do. Oh, and boas entradas right back at you, minha querida. Signed, the very busy important professor lady, who's clearly far too busy to ever sign her name to these things. All I can say is ouch. Aren't bird bones hollow? I seem to remember reading that somewhere.